Made in France by Savourea, each Salty E Liquid contains Nicotine Salts, capable of rapidly diffusing Nicotine in the body and with a much softer hit. Available in a 10mg and 20mg of Nicotine, the Salty E Liquid will satisfy your needs and your fruity desires. Red Berries, Banana Vanilla, Acidic Lemon, Delice of Apples or even Polar Mint... the Salty E Liquids preciously preserves the great quality of flavours and you will not get tired of them. 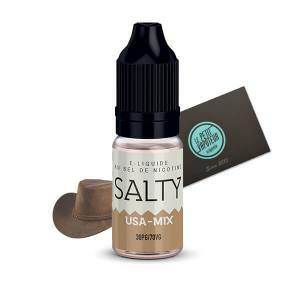 Benefit with a generous vape, the Salty E Liquids have a proportion of 30/70 PG/VG.